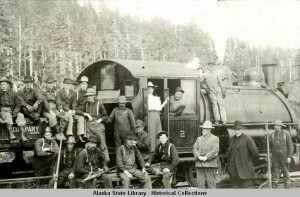 Railroad Engine #2 at Katalla, Alaska, circa 1905. ASL-P11-172, Ray Moss Photograph Collection, Alaska State Library-Historical Collections. This section provides educational material for students, teachers and the public interested in learning more about Alaska history. The Alaska 67: A Guide to Alaska’s Best History Books by the Alaska Historical Society provides a list of the 67 best books on Alaska history published through 2006, and is an essential reference for those interested in exploring Alaska’s past (Walnut Creek, CA: Hardscratch Press, 2006. 95 pp., ISBN:0-9678989-9-4. Price: $16.50). The Alaska Historical Society. “Alaskana.” Alaska History, 2000-present. Alaskana is an annotated listing of recent publications on the North that appears in each volume of the Alaska Historical Society’s quarterlyAlaska History Journal. The lists have been compiled by Alaskan librarians.